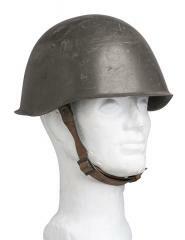 The Czech helmet is modeled directly after the Soviet SSh40, but with different lining. 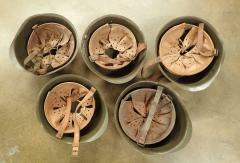 The chinstrap is either nylon or leather, depends on when the pot is made. 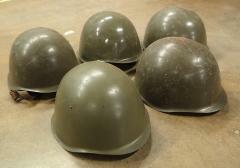 All of these are old Cold War surplus. 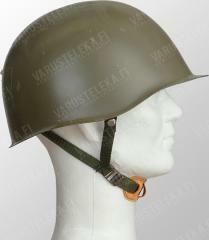 A very standard looking East Bloc helmet, the Czech pot is a cheap alternative for the more pricey Soviet SSh40. You want a cheap steel helmet, buy this one. We get these with a three-point nylon chinstrap complex or a very traditional leather two-point system. Lately the leather ones have been way more common, which is good because they look better. In used condition, and sometimes not very pretty either - prepare to clean it up a bit. Not sold for any real protective purposes of course, only as a collectible/costume item. I received the leather liner version. Good for display, not so much for re-enacting as you may get one that won't fit. The liner I received was very tiny. The adjustment is thoroughly seized, but I'll update if I can ever get it to move. Even still, there does not seem to be too much to move. I believe the liner is adjustable, but likely came in sizes, like 54-56, 57-59, etc. The leather is VERY dry. Neats foot oil is a must. Update: There are 3 snaps/buttons at the back of the liner to connect the leather to the liner band as you expand it. I now see mine is at its widest (and still stuck there) and it measures at 56. There is an ink stamp in the shell that reads 54. At first I thought it was a date stamp, but now I think it means its a small 54 (expandable to 56) liner. As mentioned above the leather chinstrap is very dry but almost a perfect fit for my 55cm noggin, once I've figured out how to adjust it should fit nicely. Like the other couple of steel lids I have it's surprisingly light to wear, especially compared to modern ballistic nylon/kevlar helmets. For the price you can't go far wrong especially if you have a small head. To get a bigger size, all you need to do is ask. At 57 cm, I asked in the comments when I was ordering that I wanted a bigger size so I could wear it. They sent me one that has a 58 stamped inside, and after loosening the liner slightly it fits perfectly. The wear on the helmet is exactly how much I wanted. Quite a few minor scratches but it still looks great. The leather liner was in amazing shape. This is probably the happiest I've been from an item I ordered from Varusteleka. I got really lucky in that I received a size 66 that fits my head quite comfortably. 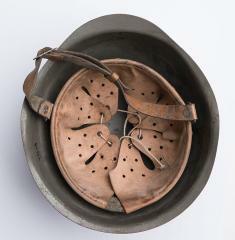 The liner and straps were quite dry and had some mold on them with the inside of the helmet being coated with what looked to be gravel (?) but after a good cleaning all is well. Lots of scratches, etc. but that just adds to the character! Sain vihreän tekstiilisen leukaremmin omassani jonka muutenkin halusin, Siinä on myös paljon naarmuja ja sisällä paljon tuhkalta vaikuttavaa ainetta mutta pikku pesun avulla nekin lähtee. Olen hyvin onnellinen saamani kanssa ja suosittelen tuotetta.